IIt’s not easy figuring out how to start optimizing your band’s presence in search engines. So we took all of our SEO advice and broke it down into one handy checklist. 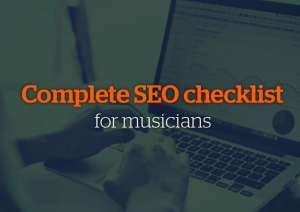 For details on how to do each of the things on the list, you can refer to our “Complete Guide to SEO for Musicians” eBook. ▢ Try to get other websites to link back to your band website when possible, such as when you get press. ▢ Create a Wikipedia entry for your band. ▢ Create a Wikidata.org entry for your band. ▢ Create a MusicBrainz entry for your band. ▢ Create videos for each of your songs, and upload to YouTube. ▢ Optimize your YouTube videos for SEO. ▢ Set up Google Analytics to measure visits to your website from search engines. If this checklist is making your forehead sweat, just check out the eBook. Everything is explained clearly in detail, and in a way that’s easy to follow. We hope this helps you start working on your music SEO! This post was written by Wes Walls and originally appeared on the Bandzoogle Blog. Wes Walls is the Head of Growth Marketing at musician website & marketing platform Bandzoogle.